the history of the Ivy on the outfield walls at Wrigley Field. Wrigley Field went through a renovation primarily to the bleachers in 1937, but that is also when the ivy was added to the outfield walls at Wrigley. The ivy was added primarily to make the stadium look better which it certainly does, but also an attempt to cushion the outfield wall made out of brick. The wall is still to this day not one that you want to crash into unless you aren't that concerned for your health. One memory I have is of former New York Mets outfielder, Darryl Strawberry going back on a ball hit deep and thinking to myself "he doesn't know that there is a brick wall behind that ivy" and sure enough, he crashed into the wall and ended up leaving that game. A more recent memory is seeing Sam Fuld brave the wall jumping high with his back up against the brich wall covered with ivy. It is still one of the best catches I remember at Wrigley. According to "MrBrown Thumb" at Chicago Garden (link below), the ivy grown on the walls at Wrigley is Parthenocissus Tricuspidata, more commonly known as "Boston Ivy". Wrigley Ivy-Ground Rule Double Most Major league teams get ground rule doubles when a ball bounces into the stands. At Wrigley Field, ground rule doubles are more rare than at other parks for 2 reasons. 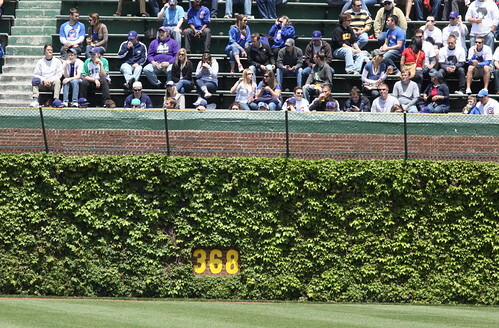 First, the most common ground rule double at Wrigley is when a ball gets trapped in the ivy on the outfield walls. The tricky part with this is that the outfielder must raise his hands signalling to the umpire they cannot find the ball and its lodged in the ivy. If the fielder makes an attempt to retrieve it from the ivy, the umpire may not grant the ground rule double. Also, if the ball is not lodged in the ivy, the umpire may not grant the ground rule double either. The 2nd reason why ground rule doubles are rare at Wrigley Field is the "basket" overhang at the top of the wall. Most ground rule doubles around the league occur when a ball bounces in play and hops over the outfield wall. I saw one such ground rule double, on May 8 2011 when Jeff Baker hit a ball that landed hard on the ground on the center field warning track and the ball bounced high in the air and at the right angle to go over the basket and into the Wrigley bleachers. The outfielder did misplay the ball to allow such a play. If you ever see a ground rule double at Wrigley Field, you should feel lucky. They just don't happen that often. Below is a clip of the ground rule double that I described. Enjoy! !